Rebecca Krupke in the new event space, Top of the Nine that is set to open on the top floor of 9 Central Street in Bangor. 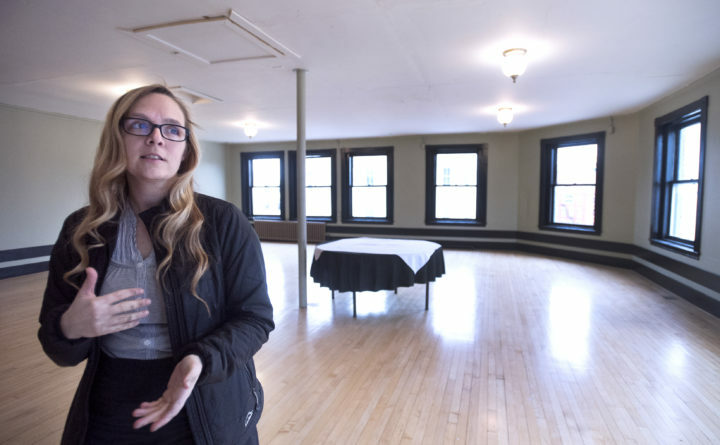 Unless you’ve taken a yoga class or filmed a professional video there, it’s unlikely you’ve been to the top floor of 9 Central St., above The Grind House and Jersey Subs in downtown Bangor, in the past 12 years. And that means you probably haven’t experienced the lovely view from the space’s multiple picture windows — a fourth-floor panorama that allows you to see all the way up Main Street, and on both the Central Street and State Street sides of the Kenduskeag Stream. 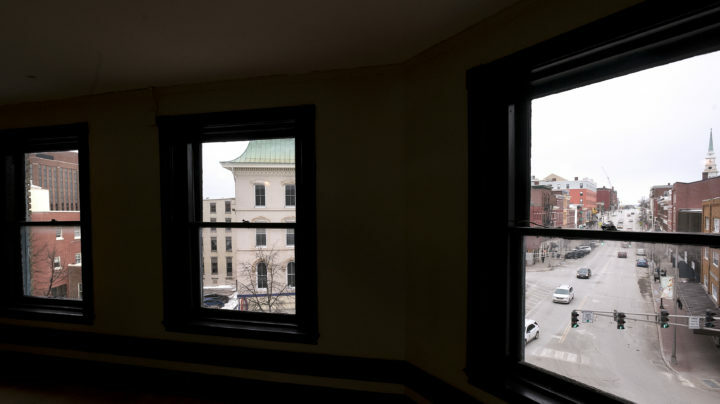 It’s that view of downtown Bangor that inspired local artist Rebecca Krupke and her business partners, Dan Sullivan and brothers Jackson and Tristan Greenlaw. And that’s what they want to showcase with their new arts and events venue: Top of the Nine. The view of downtown Bangor from 9 Central St., where Rebecca Krupke, Dan Sullivan, and brothers Jackson and Tristan Greenlaw have opened the new arts and events venue Top of the Nine. Top of the Nine will feature a combination of in-house programming and rental space for visual arts, dance, music and culinary events. Its grand opening is next week, Feb. 7, and its first big event is a swing dance social set for 7:30 p.m. Saturday, Feb. 9, with basic dance lessons at 7 p.m. led by ballroom dance instructor Terrence Lee. Krupke and her partners have remodeled the space to clear out old fixtures and open up more room for people. The space was most recently home to Osborne Media, a marketing firm that has since relocated. For nearly a decade prior to that, it was the original location for OmLand Yoga, now located at 6 State St.
Krupke has added a number of Art Deco design elements to reflect the fact that 9 Central St. was built in 1912. Art Deco as an art style and movement peaked in the 1910s and 1920s, a period when many buildings were built in Bangor in the wake of the devastating Great Bangor Fire of 1911. “I love this era for design. I love Art Deco style, and there are elements of it all over Bangor, so we wanted to offer some of that old look for the space,” she said. While there are other rental spaces and arts venues in downtown, such as COESPACE and the Meeting House at Bagel Central, Top of the Nine is uniquely suited to dancing events — it has a large, open hardwood floor, perfect for Latin and ballroom dance. Krupke said they plan to host a monthly dance social, and possibly other dance and movement events as interest builds. Krupke also anticipates Top of the Nine offering space for special events during the Downtown Bangor Art Walks, held on the first Friday of the month from May through October. 9 Central St. houses multiple artist’s studios and other creatively oriented organizations and businesses, and is something of a hub for the monthly art walks. “There are a ton of possibilities for this space,” Krupke said. Other upcoming events include a Valentine’s Day social and potluck Feb. 14, a yoga and aromatherapy session March 9, and the Bowls Gowns of Bangor event, a fundraiser for a local charity, in which guests will meet for a party at Top of the Nine, and then wear formal wear to go bowling, set this year for March 23. For more information, visit www.topofthenine.com.